Maybe you can endonnogeom or something? addin.xml name needs to be changed from just 'level1'. Better than ever , thanks for the recomendation and I know what was endonnogeom! Ok, cool. But davidc also said to change the name. Currently it still says "level1". A subtitle would also be preferable. You can change this in WooGLE. warning: Parameter 1 to goopackage_changestatus() expected to be a reference, value given in /www/htdocs/goofans-live/www/includes/menu.inc on line 349. The Official download is "theMightyHoax"
Yeah, it's a bug in goofans. Hopefully it'll get fixed soon. Sorry for the inconvenience. What about copyright? Is this okay? Not sure if that argument will stand up in court. @AP: I don't think Rovio can sue him as long as he doesn't charge for it. Nahhh...Rovio will take it as "Fan art" . A question:No one had problems to publish something about the copyright(I´m Talking about seroius Problems)? 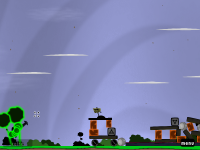 By the way...Do you like the level? This level was great. I'm actually a little surprised it hasn't been done before. It's fun and nice to see all those birds in Goo, but it is a tad bit easy. If you set the first fling value negative*, the player would have to pull back to shoot just like in the original angry bird game. Really? Goomatz, you are awesome. Yes, there have been copyright problems. Especially with Another Planet. With music and pictures and stuff. It was my personal feeling that this would fall under "fair use" or similar, but the key is to use as little of the original work as possible. Are a few sounds and 5 images too much for that? I dunno. Just discovered, the negative fling value makes the Goo to shoot always with full power. For it to be fair use it needs to be for an educational purpose. I have to change some stuff in Another Planet because of that. @goomatz: Aww, too bad. Good idea, though. @AP: Really? Where'd you hear that? I thought it depended on how much you used. Bill S.978 will make that list even more strict. I suggest emailing them and asking for direct permission, so you have proof they allowed you to use their images/sounds. Ah, my mistake then. I stand corrected. My conclusion:All is good if the government doesn´t email you! Actually, the government wouldn't email you. This is a law, so games companies would email you if they disagree with what you post. No, they'd email David, and he'd get in trouble. That's why Daft was always careful to unpublish copyrighted stuff. I was actually talking about the internet in general, but yeah that would make sense. Ok, ok i will erase this goomod forever!Ok? Haha! You think was true? Only dont mess up the things and don´t be bothering with copyright. Sorry for the Agresive comment but it was necessary! Well, you kind of have to "be bothering with copyright", because it's the law. Naw, don't delete the goomod. Just change the graphics and sounds, and you'll be ok. No need to get upset about it. What does necessary means? If you are talking something about copyrighting then... I want to get in... I copied Wiki image from internet by making wiki balls so I'll put my demo level soon! Only wont there will be problems if I copied the images? And why exactly did you need to make a comment saying that? There's nothing wrong with the level. Unpublished. At least until you change the sounds and images. I get very upset as I seen all this Copyright issues. Also If i took a decisition inmediatly i will take actions. Naw, man, no need to get all upset about it. The level is impossible and not as fun now. Just change the IMAGES and SOUNDS from the original. We're not asking you to change the whole level or anything. There should be plenty of images online for birds that AREN'T copyrighted, and you can use the original Bit sounds. I imagine there are plenty of takeoff Angry Birds games already, so nothing is wrong with having something exactly the same, just use different images and sounds than the original. Nobody cares about anything else. I reverted your changes. Don't get discouraged so easily, please. If you have a different idea for a level, upload it on a different page, and I'll make the decision of whether it should be in place of this level or not. Okay! New, legal version published. YAY! After I took the bird images and sounds out, I also made a few other changes to make it more fun (in my opinion). Let me know if you have any other suggestions. Sorry for taking so long on this. OCD is 4 moves, which seems fairly good based on a small amount of playtesting. If nobody can get 4 moves, let me know (I personally haven't; I just threw this together in a couple hours). 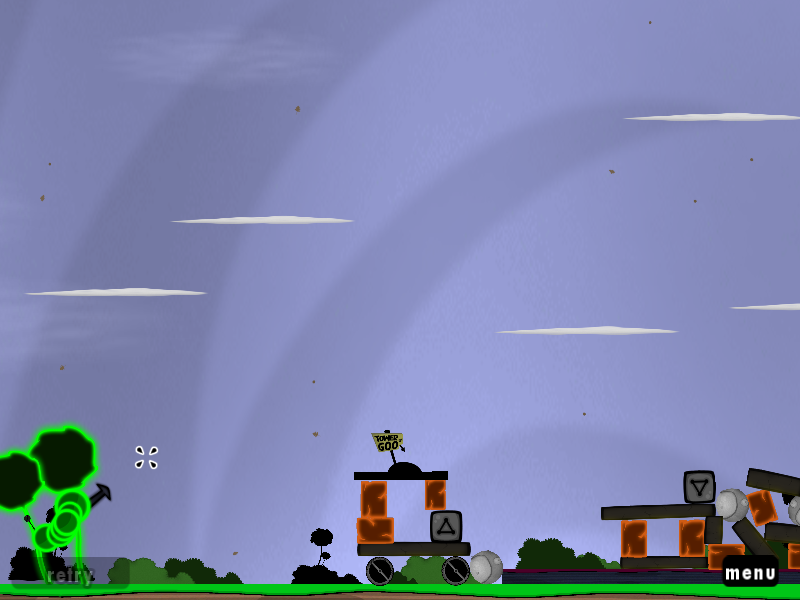 I had an idea that may or may not have worked for making it more Angry-Birds-esque. Basically, there are two pig-type creatures. As you'll notice, the blocks all around are mostlydeadly (to make the AngryBalls explode on contact), so the goal was to have these two Goo Balls invunerable, with deadly geometry above them. If the stuff above them falls down, they're dead. Also, they're connected via long, invisible, unwalkable strands to two other goos (could be the same type) that are VERY large and on top of one another. If one pig guy dies, the Goo Ball on the other end is released. If the second one dies, the physics engine pushes them apart from one another. They're right beside a giant fire that they can't avoid if they're not overlapping. They ignite, they have a small burntime, and a gigantic detonateradius. I kinda ran out of time to implement the idea, but it should work fine, and anyone else can if interested. If I'm making no sense, ignore me. Enjoy the level. Maybe zoom out a bit so that the fligable goos aren't so big.